Common annual or biennial weed of cultivated and waste ground. Leafy, upright habit with thick hollow stems and large toothed, greyish green leaves. Shallow rooted. Stems and leaves often have a reddish tinge. Has white milky sap. Clusters of pale yellow, dandelion-like flowers about 25mm across. 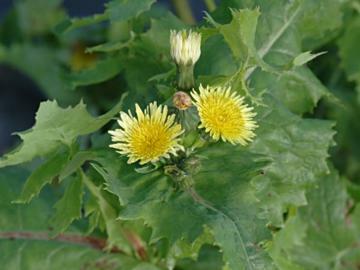 Similar to the Prickly Sowthistle but with flatter, smoother leaves, more rounded when young. Will grow in a wide range of conditions. Has been commonly used as a medicinal herb. European native, widely naturalised elsewhere.